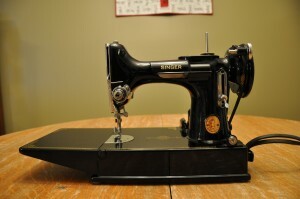 My husband surprised me tonight with an early Valentine’s gift–this Singer Featherweight 221-1. She is still unnamed although we know she was born November 7, 1949 in the Clydebank, Scotland factory of Kilbowie with serial number EF563501. She is missing her bobbin case so she will not be pressed into service until I am able to locate and purchase one. I have been on the hunt for a Featherweight for some time now. I recently lost out on one on an e-Bay auction and then lost out on a white model because someone got to the seller before I could. I was beginning to think I was never going to lay my hands on one of these precious machines. That is until, tonight. 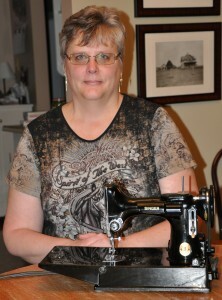 EDIT (Feb 9, 2013): My Featherweight now has a name! My husband and I have named my Featherweight, Charlotte–a Scottish girl’s name. This entry was posted in sewing machine by Norma Hanson. Bookmark the permalink. Congrats on your Featherweight! I have scored TWO..and they both just kinda fell in my lap! lol Just before Christmas I added a Singer 301 to my machine ‘family’. Her name is Harriette (after my grandmother!) and she has been accompanying me to my quilt group on Thursdays. You should be able to find a bobbin case pretty easily on ebay. I have been scouting a zigzagger. It is too bad that the innards are missing but hopefully you can locate what you need and at a fair price. It is shame that others have helped themselves to those at retreats and such, as you were telling me about.